Motivational speakers provide inspiration, motivation and have the ability to add new energy to bring changes in the lives of people as well as of companies. They have been popular and known to increase happiness, sales, leadership and performance in people. Many famous people and companies in the world regularly invite Motivational Speakers for events, conferences, seminars, leadership summits and sales meetings to bring in real and long lasting change. Some of the world’s most famous Motivational Speakers are Tony Robbins, Jack Canfield, Brian Tracy, Les Brown, Zig Ziglar, Stephen Covey, Jim Rohn. Dr. Wayne Dyer, Robert Kiyosaki, Suze Orman, Eckhart Tolle, Eric Thomas and Nick Vujicic. In India too the trend of motivational speakers is fast becoming the norm. People are inviting them to speak in order to inspire and motivate. Many event companies in India now regularly invite a motivational speakers to address a session and the best motivational speakers are in high demand. Earlier only large and multi-national companies like Google and Microsoft used to invite motivational speakers, now corporates of all sizes, even smaller and mid-sized ones have started using the help and services of motivational speakers to solve challenges and problems they face like stress and poor performance. Many have seen success like increasing sales, reducing employee attrition and increasing happiness levels in employees. All of this means better business. Besides companies even Universities, Hospitals, the Indian Army, Indian Police, Indian Railways and event Indian Political Parties and the Government regularly have now started inviting motivational speakers. While India is a very large country and there are hundreds and thousands of speakers, we have selected the top 10 motivational speakers in India. Sneh Desai is the Director of Sneh World Group of Companies (India’s foremost Training Company). He conducts his signature event ‘Change Your Life Workshop’ across 23 cities in India & also conducts his programs across the world including USA, UK, Australia, Africa, Canada and UAE. From the very young age of 9, he started delivering training programs from stage. He has trained more than 900 trainers across India. His attitude of contribution has been helping numerous people through his 100 days of FREE training programs in a year, ‘Feed in Need’ Program and Tree Plantation Drives. He is followed in more than 100 countries of the world on YouTube. His high energy & heart touching presentation style keeps his audience spellbound and overwhelmed. He firmly believes ‘Talk is Cheap’ and his unique ability is getting people to take ‘actions’ in real life to produce real results. Dr. Ujjwal Patni is a popular motivational speaker, keynote speaker and corporate trainer and largely delivers his motivational seminars in Hindi. He is known for being a risk taker and inspiring people to become leaders. He has delivered various seminars and some of his clients have been CBI and Dr. Kiran Bedi. He has also authored several books and is focused on topics like Network Marketing. He regularly attend dealer meets, conferences, sales seminars and events. TS Madan (Tarvinder Singh Madan) born on 14th November 1958 is a very famous Hindi motivational speaker and a much loved comedian and an established actor. He is also an experienced sales trainer, life coach and keynote speaker who regular speaks at various conventions, events and conferences. He has worked with companies like LIC (Life Insurance Company) of India. His style is interactive and filled with laughs and fun. He has worked in areas like Sales Training, Keynote Speaking and is considered among the best motivational speakers in India. He is very popular in Punjab. Today he has over 35 years of experience in the field of motivational speaking and his specialities are life skills, communication skills, self confidence, positive thinking, anger management, time management, leadership skills, sales skills. His sessions are usually in Hinglish which mix both Hindi and English. He also loves giving back to society and is a regular blood donor. Simerjeet Singh is a young and dynamic motivational speaker and success coach. He started working in the Hotel Industry and has a degree in hotel management and was accepted into the reputed program by Marriott International Management Training program. He had a promising career and grew the hotel business in Dubai, India and the USA. He then decided to change his path and started travelling and became a motivational speaker. Since then he has givens 1000s of motivational seminars and talks and inspired people in over 100 companies. He has worked with various companies like Tata, Novartis, PWC, Vodafone and others. His focus is on bringing in success and has a unique style of offering his sessions. He has also done some seminars and motivational talks in UAE and Dubai. Priya Kumar makes it to our list of top motivational speakers because of her dynamic style and entertaining sessions. She is also an author and regularly does videos to connect with people. She speaks at various conferences, seminars and events. She was born in Chandigarh and used to work as a tuition teacher before becoming a motivational speaker. She met Dr. Niranjan Patel, her neighbor who used to do seminars and workshops on anti-smoking. She invited him to do a seminar for her students and found an instant connect and started working with him. After he passed away, she wanted to continue the vision of bringing change and impacting people positively by becoming a motivational speaker. Her clients include Colors TV, Airtel, Bacardi and others. She is also known for her Fire Walking sessions. She is based out of Mumbai. She is also a bestselling author and written several books like The Calling. Shiv Khera is one of India’s best motivational speakers, authors and has also had experience in politics. His family owned coal mines and then after they were nationalized by the Indian Government he did various jobs like insurance agent, a franchise business and also used to wash cars before becoming a motivational speaker. He has written popular bestselling books like You Can Win and also joined politics and started a political party to bring in education and fight corruption called Bharatiya Rashtravadi Samanata Party. He lives in New Delhi and travels all over India and even internationally to places like Singapore to deliver his motivational seminars. There have been some controversies around him where in he had been accused of copying quotes, jokes and content from a book written earlier by Mr. Amrit Lal. Eventually this controversy died out and Shiv Khera settled in an out of court settlement with Mr. Amrit Lal for an undisclosed sum of money to end this matter. Chetan Bhagat is an Indian author, columnist and also a motivational speaker. He was born on 22nd April 1974 and grew up around the Indian army as his officer was in the Indian Army. He went on to complete an education from the prestigious IIM and became an investment banker with Goldman Sachs. He later quit his job, after writing several bestselling books about youth and life. His books have also been made into movies and he regularly writes his column and is also a television personality and judged a TV Show – Nach Baliye. His motivational seminars are usually targeted at the youth and meant to inspire and motivate them. He is regularly invited to speak at top engineering and management colleges in India as well as by companies who want to inspire their employees. He makes it to our list of top motivational speakers in India for his diverse interests and fields. Sandeep Maheshwari has a very inspiring story. He was a regular boy born in a middle class family and started working as a model in college. He realized how models are exploited and wanted to be of help to them. He started a photography session and used to shoot photos. Many of his initial businesses were failures and finally at the age of 26 he struck gold and success by founding ImagesBaazar which is the world’s largest collection of Indian images and has millions of photos. It is like India’s version of Getty Images. His own life and struggles are what inspired Sandeep Maheshwari to become a motivational speaker and help people. His sessions are emotional and filled with purpose and meaning. He doesn’t do these motivational seminars for any company or college, but does it on his own where people can attend. His beliefs are that everything is easy to do and becomes even easier when you actually do it. For all the excellent inspiration, Sandeep Maheshwari makes it to our list of best motivational speakers in India. His videos on Youtube are a definite must watch! His ideas are also very similar to those of Deepak Chopra and Yogesh Chabria when it comes to using the power of the mind. Robin Sharma doesn’t live in India and is based out of Canada. However, we added him to the list because he is of Indian origin and his book The Monk Who Sold His Ferrari has had real impact on the lives of millions of people. It is the story of how a lawyer has all the money in the world but doesn’t have true satisfaction and success. The story is partly based on Robin Sharma’s true experiences as a lawyer and how he quit to become a motivational speaker and leadership coach. When he started he used to struggle with his books and seminars and tried and tried till he achieved massive success. Today he works with the worlds biggest companies like Nike to help them disvoer leadership, motivation and sales. He has shared the stage with people like Bill Clinton, Richard Branson, Jack Welch and Tony Robbins. Yogesh Chabria is one of India’s best motivational speakers because in addition to being a motivational speaker he has also experienced what he speaks about as an entrepreneur. He is the founder of The Happionaire Way and he was born in very hard surroundings where he could not afford to travel by auto or bus and started selling toys at the age of 5. After selling toys, he moved to Iran and even in school used to sell comics and clothes. He returned to India at the age of 16 and used to do go door to door selling, where he faced lots of rejection. Someone even left dogs behind him while he was going door to door selling, this made him stronger and since then he started carrying dog biscuits with him. He founded The Happionaire Way where his focus is on overall growth, happiness, entrepreneurship, leadership, sales, motivation, business, emotional mastery along with financial and spiritual growth. He also takes inspiration from Goddess Lakshmi and Goddess Saraswati and brings them in the modern world. He regularly practices Transcendental Meditation (others include Deepak Chopra and Katy Perry) which he discovered when he was 14. He has also been a part of Chicken Soup for The Soul along with Jack Canfield. He is also #1 Bestselling author and has spoken for thousands of companies and events around the world. His clients are top CEOs, Billionaires, Royalty and Movie stars in addition to millions of regular people and companies. His sessions are entertaining, interactive and massively successful which have been attended by people in over 100 countries. He has regular columns on CNBC, Entrepreneur magazine, Times of India, Addicted2Success and has been featured in hundreds of newspapers and magazines. Check out his interview on my blog. Deepak Chopra is originally from Delhi and was trained to be a Doctor. He moved to America and had a very successful practice as a Doctor. However, as time went by, Deepak Chopra got interested in spirituality and started practicing Transcendental Meditation with Maharishi Mahesh Yogi. He also was very close to Maharishi Mahesh Yogi and spread the benefits of TM globally. Later there were some differences between then and he separated. He then went onto write several bestselling books on health and overall wellbeing. He stopped practicing as doctor and now focuses on overall well being of the mind, body and soul. While he is now based out of America, he makes it to our list as the best motivational speaker as he has had huge impact. Millions of people have benefitted from his ideas, seminars and books. He has been known to have had a huge impact on people like Oprah Winfrey, Michael Jackson and several others in Hollywood. He also organizes popular retreats and runs a holistic center where people can come to distress and rejuvenate themselves. He was currently the Brand Ambassador of Payoneer( International Payment Solution Company) and a strong online influence over popular social media channels. He also takes initiative to share his experience with young aspirants and budding entrepreneurs at blogging and start-up events. Through his first book : Inside A Hustler’s Brain : In Pursuit of Financial Freedom he want to help people to take actions in their life and bring change in people mindset. To be an entrepreneur mindset is everything. Over to You: Who is Your Favorite Motivational Speaker in India ? We hope you enjoyed this exhaustive list of Best Motivational Speakers in India. We are proud to state that this is the best and most accurate list we have prepared after short listing all the motivational speakers in India. We will keep updating this list of Indian motivational speakers and will be happy to hear your comments on this list! Excellent list Jitendra! I love Yogesh Chabria because he himsefl has created and practices everything he speaks on. I myself was able to really change my life and grow my business by folowing his happionaire ways! Jitendra you have shared a superb list of motivational speakers I have seen in India. Though Yogesh Chabria should not be in this list as he is not at all a motivational speaker. He recently came to our company and shared some strategies that have increased our sales by over 50% in a month and helped us change our mindset. He is more of an entrepreneur and strategist. Of course our sales increased because we took action on it! Agree Deepak Chopra is the best! He is a happionaire! You have explored best motivational speakers from country wide and they are really doing well and helping people to overcome from their personal issues. Dr. Ujjwal Patni is really a genius man, I’ve learned manythings from him regarding common issues which occurs in our daily life. But my favorite motivational speaker is Sandeep Maheshwari, he is very simple man – And I’ve listen almost every session on YouTube. Eventually, thanks for revealing a light on this topic. Yogesh is the best speaker since he creates confidence in every situation. He shares secrets of success and inspires the audience to think and act positively in any situation. His talks and illustrative presentations creates hope for the disheartened and this is the medicine which even physicians cannot prescribe but admire . Superb list Jitendra! 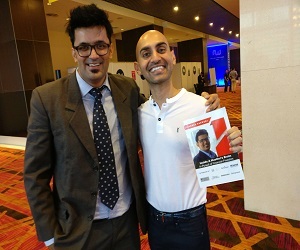 My personal favorites and Sandeep Maheshwari and Yogesh Chabria! Nobody can beat them! This is surely the most detailed and best list of motivational speakers in India and was happy to read this so much. Only I don’t like Yogesh Chabria and Sandeep Maheshwari as they should NOT be on this list. They use their own business advantage and are competing with others who are only motivational speakers. They have their own programs which have like 5,000 to 10,000 people because of their own business and smart marketing. Other motivational speakers don’t have all this! Plus both of them keep telling how they came from poor families and were failures in the beginning…why would I want to listen to failures? For me Shiv Khera is best motivational speaker! WOW! What a list of top motivational speakers Jitendra! Really loved it! Thanks for sharing! we are an event company and have regularly worked with Yogesh Chabria, Chetan Bhagat and Shiv Khera! The best list of motivational speakers in India!!! Great Jitendra! Which ones are the best in Mumbai? Yogesh Chabria(though he is not just a motivational speaker!) and Chetan Bhagat are the best motivational speakers in Mumbai as of day! Jitendra do you have idea how much they charge? Loved your site and techniques Jitendra for making the real financial freedonm by living like a hustler……now a days even bollywood stars like Shah Rukh Khan and Anil Kapoor are becoming motivational speakers as every person needs to be super….inspired…and motivated….keep this up and great list! Jitendra yours is the number 1 list of the best motivational speakers in India ……real hats of to you for making such a great list……. any idea of how much each motivational speaker charges Jitendra? Charges for the speech Motivational Speaker varies based on the event i.e. whether it is a corporate event or other, what would be the size of the audience, what is the topic, who is going to be the audience and many more..
As a motivational speaker, I can say that professional speaking fee of most speakers in India varies from FREE to Rs. 5,00,000. Though for a really BIG event, people can charge more too. Though not every speaker is a motivational speaker. As shared on this page: http://motivationalgyan.com/speaker, it could be the case where a Bollywood Super Star is coming and delivering a speech or a startup unicorn is speaking at business event and charge a lot more. Each one is the best! sandeep Mahshwari and Himesh Madaan are both great in their own way. Nice list Jitendra! These are really the best motivational speakers in India! All these motivational speakers are best motivational speakers of India! But I thing SANDEEP MAHESWARI is the best motivational speaker in India. I personally attend his lots seminars & following him since last 2-3 years. At this second 1.7million of people subscribed his YouTube channel. Best ever motivational video via SANDEEP Maheswari because He has a whole lot of disasters in his life. He failed every and each enterprise he tried for nearly 8 years. He is a creative younger entrepreneur, anyone can make him their mentor. Priya Kumar, Shiv Khera is also best motivational speakers and writer. Sandeep Maheshwari is best motivational speaker in india. I feel like Shwetabh Gangwar from mensutra should’ve been on this list. Do check him out! When a motivational speaker speaks he touches the very lives of his listeners ! He identifies his or her miseries, sufferings, hopes, adventurous, fears, love and a lot many emotions with the life of listeners. The worried, dejected, fearful, confused, disappointed, tensed people find a ray of hope, way for proceeding ahead in life. This is not a magic but reality. The speeches are not for admiration but for a transformation. If some one says” I liked Mr or Ms X’s speech”, then I will ask him or her , ” so what, have you transformed yourself and become a vibrant new person? “. As long as there is no transformation by the inspirations we get, it is of no use. So, I would appeal to every reader of this blog, look into yourself and analyze yourself who you are , what you are and why you are so? You are the result, the consequence of a long chain of human race before your birth in which you too are one part. Every thought , attitude, action, liking , habit you has a invariable connection with your genes that carry the experiences, decisions, actions of so many people of the past generations! So, accept yourself as you are without any self blame or blaming others. In the light of your present knowledge , available to you from your own senses and that of others, bring in the best course of action in your life as beneficial to the whole human race because you are the part and parcel of every human soul on this planet ! Identify yourself with every human being in pain or pleasure. You will experience the divine soul in you. the ignorance and illusion of people too will come to your consciousness and you will be much closure to your intuition which can detect every human craving, suffering and ignorance. This will make you to communicate to them what is the best course of action for them and hence you will be most powerful and influential motivator and speaker in this world. So my dear reader the most powerful speaker is residing within you. Only thing is that you have to identify, realize and accept this truth. That is possible, when you identify yourself with every human soul as your own image and whatever is good for them in the real sense is good for you too and you must give them complete support, encouragement and cooperation in making them shine in the world, which of course, your own shining! Sandeep maheshwari is not only best motivational speaker in India ,but also in the world .He sees things in a way that very few people can see. Sandeep maheshwari is not only best motivational speaker in India but also in the world .He sees things in a way that very few people can see. Hi, Jitendra Vaswani as you said you want to be on the list of motivational speaker, On my list you are on the top. Really inspired me. Really liked your post Jitendra Vaswani, especially biggest regret and still no girlfriend. Without any second thought, Yogesh Chabria is the best of all. He isn’t just another motivational speakers like the rest of them. He adds value to your business, to millions of life globally. Great informative post. Thank you for sharing a list of best motivational speakers in India. Why didn’t you include Shwetabh Gangwar from mensutra? Why you have not included dr. Vivek Bindra. Gour Gopal das should also br added to the list. Where dr vivek bindra stand for motivational speaker. Simerjeet Singh & Sandeep Maheshwari are the great speaker..
Glad to read about all these motivational speakers from India. Giving motivation to someone is the best thing one can do to help others. I’m also a motivational speaker from India.